Janet Perethian Stauffer of Westwood, MA passed away on November 25, 2012. Janet graduated from Colby College in Maine. 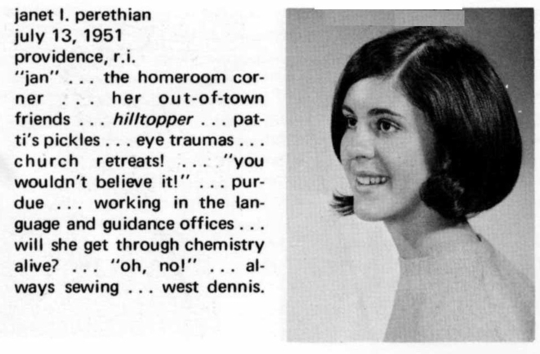 Janet lived in West Hartford, CT after college, eventually returning to Needham in 1986. She moved to Westwood in 2006. Janet is survived by her husband Dale Stauffer and her 2 sons, Stephen and Chris Bigelow.